The Park is located adjacent to Edenton Bay, which borders the expansive Albemarle Sound, and as a result is a slightly-salty oasis for water lovers. Serving as a small patch of green space and boat docks that border Broad Street and Water Streets, this little park is perfect for a quick picnic lunch, a leisurely tour of the surrounding sites, or even a full weekend stay. In fact, Colonial Park's biggest attribute to mariners is arguably its collection of transient slips that are open to passing vessels for a complimentary two night stay. Restrooms and shower facilities are both available on site for visiting boaters, and car service is also available (for a small fee) to local laundromats and grocery stores as needed. A Dockmater's office is located on site for questions, services, and any other information a new Edenton maritime arrival may require. Visitors who travel by car but still want an opportunity to enjoy the water will also find seasonal canoe and kayak rentals at the Dockmater's office as well. Overlooking the Edenton Harbor, the newly moved and restored Roanoke River Lighthouse, and the gorgeous adjacent Barker House, a kayak trip launched from Colonial Park is easily one of the most scenic tours of the waterfront region. A preferably waterproof camera is all but required for an afternoon or sunset paddle, as the vantage points of the bordering historic structures and local attractions are simply unparalleled. 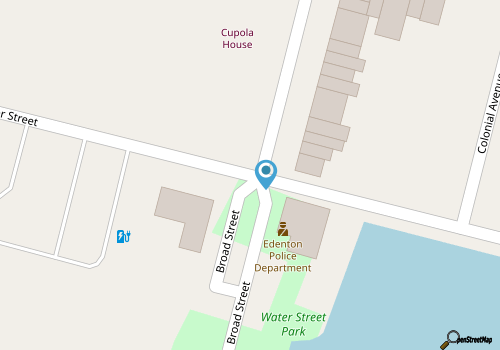 Colonial Park is also readily within walking distance of the Barker House, the Historic Edenton State Historic Site Visitor's Center, a vast range of both walking and trolley tours, and a number of waterfront restaurants and shops. The Chowan County Arts Council is also located just steps away from the main parking area, making it easy to enjoy this terrain close to the water, and close to the neighboring attractions. That's not to say that the park itself can't be enjoyed on its own merit, as in addition to the marina, boat dock, and boat launch, as well its incredibly easy proximity to some the region's top attractions, Colonial Park is also a pretty green destination in its own right. 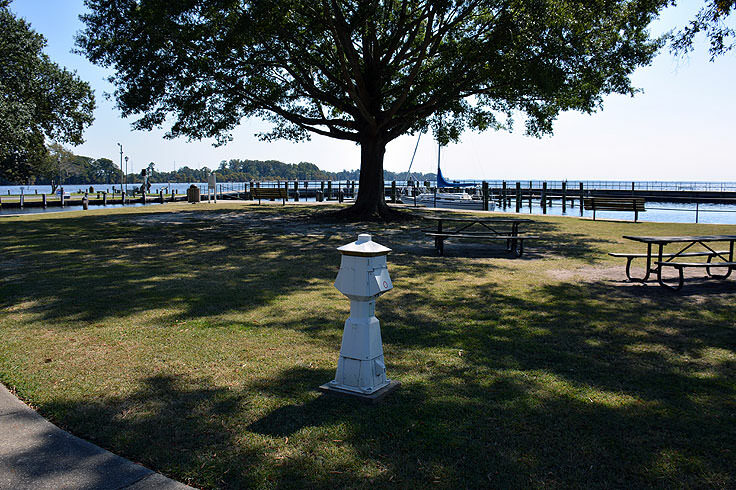 The small but private stretch of waterfront is lined with benches, so visitors can enjoy endless views of the neighboring Roanoke River Lighthouse and the open water, and there are ample picnic facilities for a quick meal close to the action by the Albemarle Sound. 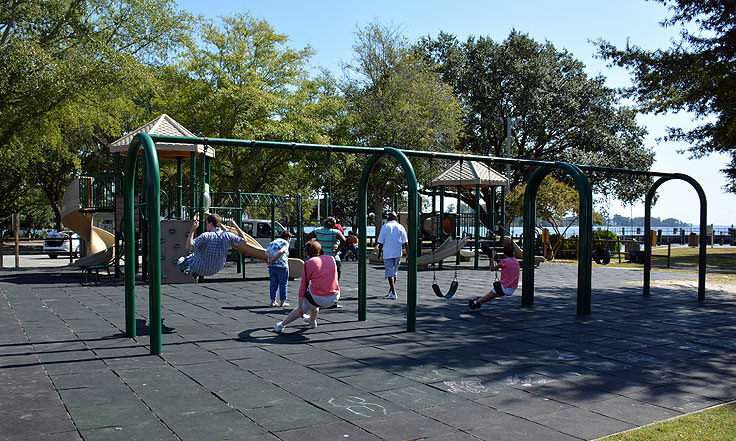 A playground is located at the park, so young visitors can expend a little energy while adults enjoy the scene, and the park is also a favorite spot around sunset and sunrise, when the Edenton Bay is a simply gorgeous, peaceful landscape in a rainbow of watery colors. 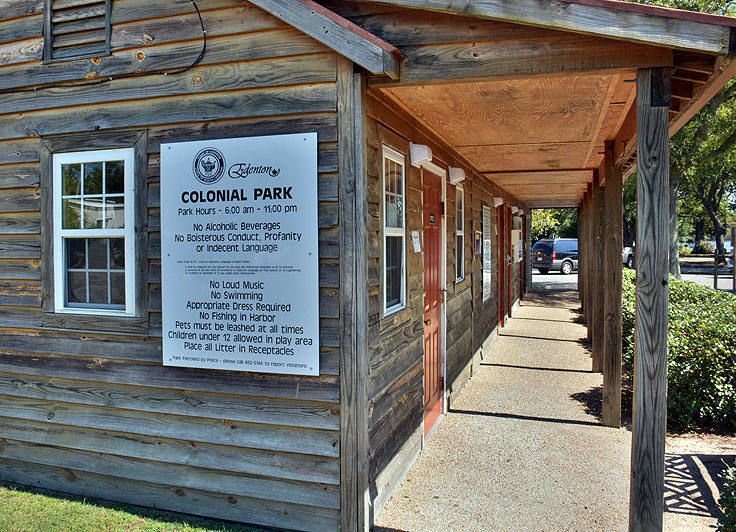 In addition to its everyday amenities, Colonial Park is also the home to a number of seasonal events, including the Annual Water and Music Festival, (generally held in June), holiday regattas, and a variety of other special occasions that celebrate this historic town's life by the water. In fact, the park was the site of a number of big events during Edenton's recent 300 year celebration, held with enthusiasm and large-scale visitor and local attendance in 2014. While everyday visitors most likely won't encounter a large crowd or a grand event on a typical afternoon, this easy-going atmosphere only lends to the charm of Colonial Park. A treasured site along the Inner Banks, both for its hospitality to mariners and convenient access to local sites for the public in general, Colonial Park is a pretty little soundfront oasis that perfectly captures Edenton's unique variety of activity by the waterfront.